Completely Scalable = Accessible to Everyone. 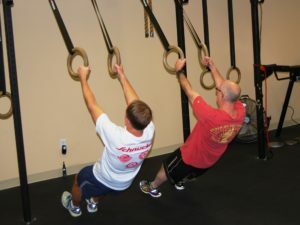 We frequently talk about how CrossFit is completely scalable. This is to say the use of natural human movement patterns allows us to alter load, range of motion, intensity, etc., to make our exercises accessible to everyone. The Dumbbell Hang Power Clean & Jerk is a perfect example. At it's apex, the Clean & Jerk is performed on the world stage with a barbell and loads exceeding a quarter of a ton! 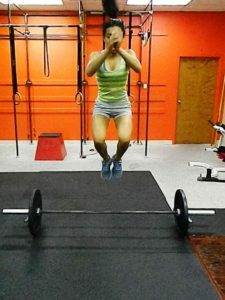 By swapping dumbbells for a barbell, we can dramatically decrease the load, and remove the … [Read more...] about Completely Scalable = Accessible to Everyone. Honestly, we don't believe there is an age limit on fitness. And Chuck is showing us the answer certainly isn't his tender age of 76! When Chuck started in March we used depth-scaled Air Squats in his program. When a proper range of motion was attained, we started loading with Goblet Squats. Yesterday marked the advent of the Back Squat in Chuck's programming; something he couldn't have even attempted at the beginning of the year! Way to go Chuck!!!! … [Read more...] about How old is too old? 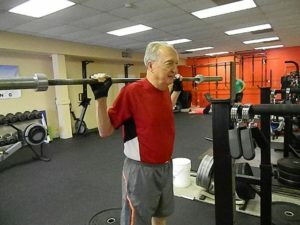 [youtube=http://www.youtube.com/watch?v=FsY7d2onKKo&feature=youtu.be]How do you scale Burpees for a 75 year old newbie? Kinda like this. We've said before; we'll say it again: CrossFit is for EVERYONE! Great work, Chuck! … [Read more...] about Yes, EVERYONE.